Helsinki sits where the Baltic Sea intertwines with the shore of the Gulf of Finland, on a peninsula and 315 islands. The unique scenery acts like a picturesque backdrop for the stylistically varied existing architecture. The city presents itself as an open air museum to the tourists, pedestrians and bikers strolling along the streets and looking for excitement, beauty and serenity. 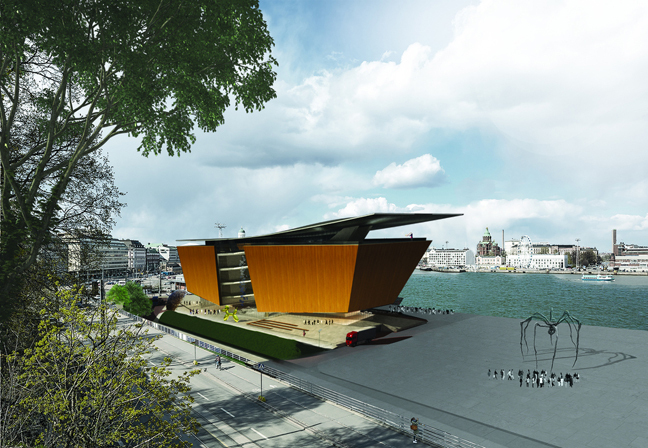 The Guggenheim Museum will be one of the landmarks of Helsinki and Europe, occupying a privileged position, in the South Harbor. Guggenheim Museums have become synonymous with iconic architectural objects which create great points of magnetism within the cities and redefine the existing hierarchies. The local background calls for a building that fits in the context, but also claims the deed of conveyance of a symbolic piece. The creative process starts from the symbiosis between the new building and the city. 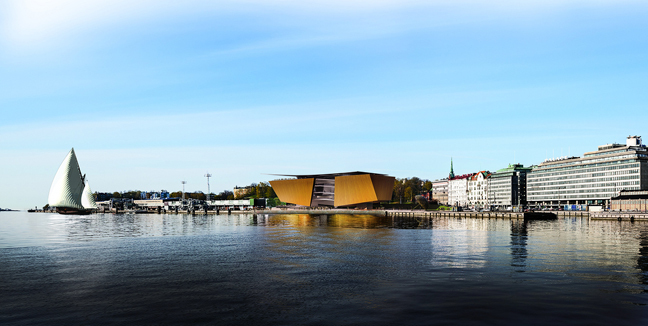 Helsinki will host a Guggenheim Museum, while the building itself will earn its specificity and uniqueness from the context. The principle of inclusion bonds the two parts in such a way that the museum will be an exhibit within the city, while elements of the city will become parts of the permanent exhibition spaces within the museum. The permeability and transparency of the building contribute to an authentic spatial dialogue: much of the content of the museum belongs to the city, while the urban life is transposed inside. The simultaneous perception of the galleries and of the city landmarks offers a holistic experience. Visitors build up a gradual sense of the external context while strolling through the museum’s glazed atrium. They recompose the surroundings from fragments as they perceive several overlapped layers: art, architecture, culture, nature, history. At the same time, the see-through character of the atrium lures people inside. 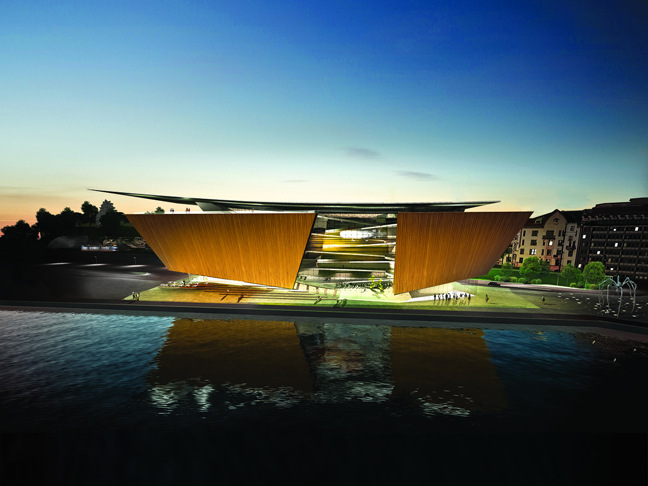 The building exudes a harbor silhouette inspired by the local tradition in boat manufacturing. 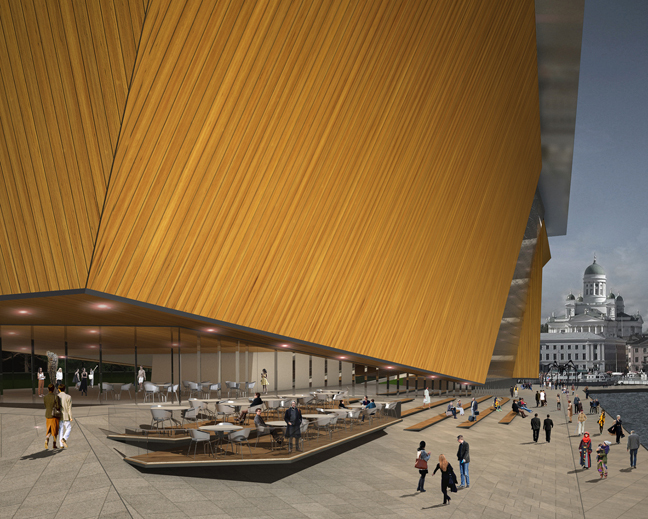 Oriented towards the sea, it embodies the upsurge of Finnish civilization and its openness towards the future. Moreover, it becomes a symbolic sculpture in a city which is also known as the Daughter of the Baltic. The image of three superposed volumes breaks down the mass but also signals the superposition of functions and the passage from public space to gallery. The waterfront façade is set into motion and takes the massive building back to a human scale. 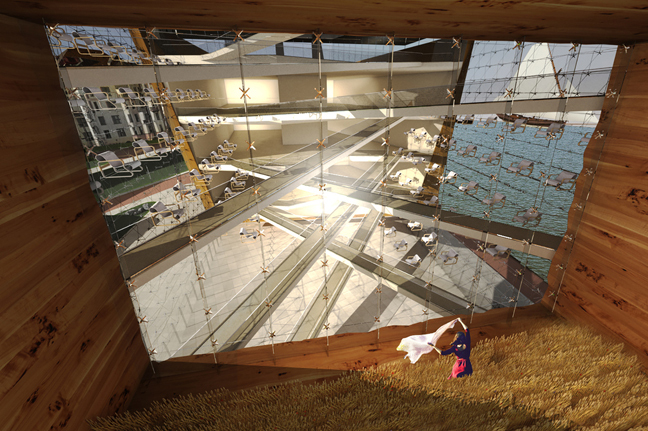 The sloped canvas unifies the exhibition spaces and the atrium and flows from the city to the sea. Seen from below, it acts as a mirror which reflects the sea and the nearby buildings. The project uses local materials, such as Siberian larch wood and steel and is designed according to sustainability principles. A coherent image is generated within the city. Iconic and sculptural, the museum is born from a careful and restrained response to the context. Afterwards, it is enriched with a few cheerful elements which invigorate the assumed tranquility of the rest of the construction and which, in turn, are bearable by the contrast with a reserved background.